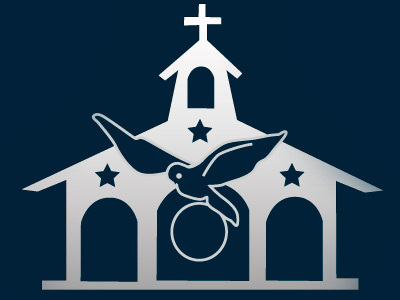 On November 15th and November 22nd, 2014, the Servant Sisters of Alcalá de Guadaira had get-togethers for girls at the Shrine of Our Lady of the Eagle. A total of 65 girls participated in the two get-togethers. Although there were was a pretty big chance of rain, Our Lady gave us two splendid sunny Saturdays so that we could have the get-togethers outside, around the shrine. 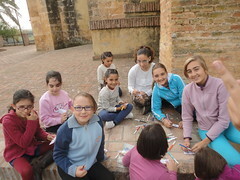 We started out the day making nametags, as there were several new girls, and we played outdoor games until it was time for the arts and craft project. This month, the craft consisted in making the first initial of each girl's name with cardboard and fabric cutouts, to give the effect of a collage. The craft is always a great time to be with friends and to help each other out. During the craft time, the girls also had the opportunity to go to confession. For some of them this was one of the key moments of the get-together and they were very grateful for the opportunity. The morning flew by and, before we knew it, it was time to eat. We blessed the food and ate outside, in front of the church. We took advantage of our mealtime to talk and to get to know each other more. Many girls said that what they like most about the get-togethers is learning new things, both about God and life, and the crafts, of course. After eating, we split into two groups to have a meeting, to finish what was left to do of the craft and to play. In the meeting, we watched a cartoon music video made by a catholic group called Valivan about the parable of the lost sheep. It helped us see how we are so many times like the disobedient sheep who strays away from his good shepherd. Thankfully, Jesus is so good that he never grows tired of looking for us when we get lost. In general, the girls really enjoyed the video, and our conclusion was that, like the sheep, we stay close to Jesus our Shepherd.